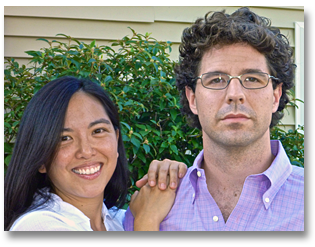 Aki Kamozawa and H. Alexander Talbot are Ideas in Food, a blog, a book, and a culinary consulting business based in Plumstead, PA. They also co-own Curiosity Doughnuts, a small, artisan doughnut shop, open weekends only, in the Stockton Market across the river in Stockton, NJ. The two met in the kitchen at Clio in Boston in 1997 and have been cooking together ever since. Aki and Alex specialize in sharing techniques for creativity with chefs, cooks, restaurants, food service companies, and home cooks based on the premise that a solid understanding of science and technique coupled with high quality ingredients, modern equipment, and innovative approaches to cooking makes anything possible. They specialize in helping other chefs express their own cuisine more clearly and effectively. In addition to their work with individual chefs and restaurants, they have consulted with companies including the Art Institutes, the Institute of Culinary Education, Marks & Spencer, and Unilever. Their first book, Ideas in Food, Great Recipes and Why They Work, was published in December of 2010 by Clarkson Potter. It is a handbook for cooks and chefs, teaching them how to unleash their creativity, intensify flavors, improve efficiency, and have fun in the kitchen. Ideas in Food is a blend of stories, science and recipes based on their experience and experiments in the kitchen. Their second book, Maximum Flavor, Recipes That Will Change the Way You Cook, was published by Clarkson Potter in October of 2013. It’s a workbook with practical and delicious recipes to cook every day at home. It includes a plethora of tips and techniques for the getting the most flavor out of your food and making every dish your own. Their third book,Gluten Free Flour Power, Bringing Your Favorite Foods Back To The Table, was published by Norton in March 2015. It is an exploration of family favorites made possible by creating gluten free all purpose flour blends at home. Aki and Alex began the blog Ideas in Food in December 2004. It began as a digital notebook to record their work in their restaurant kitchen. It has morphed into a clearinghouse for ideas gleaned from various mediums: restaurants, blogs, books, people and everyday life; all of it relating back to their kitchen. Over the past six years the website’s popularity has grown from a cult following of professional chefs into a benchmark for culinary blogs. It is a favorite for its combination of solid information, creative ideas, and illustrative photography. The focus is on sharing ways to make delicious and beautiful food. That is what draws readers back time and again. Ideas in Food was voted Best Culinary Science Blog in the 2013 Saveur Best Food Blog Awards. Aki and Alex won an IACP Award for Instructional Culinary Writing with Recipes for participating in a series of articles written for Gilt Taste in 2011. They co-wrote a series of articles for Serious Eats in 2014. Aki and Alex contributed an essay to The Kitchen as Laboratory, published by Columbia University Press in January 2012. They are interviewed in the book, Cooking for Geeks, by Jeff Potter, published by O’Reilly in August 2010. They contributed an essay to the anthology Food and Philosophy, which was published by Wiley-Blackwell in November 2007. Alex and Aki wrote a column titled Kitchen Alchemy for Popular Science online based on scientific explorations in the kitchen. They wrote an article about garlic for Santé Magazine in March of 2009. In addition to this they have been featured in articles for many publications including the New York Times, Los Angeles Times, Philadelphia Inquirer, Food and Wine, Bon Appetit, Saveur, Santé Magazine, and Gourmet, and their work can occasionally be found on other blogs and websites around the Web. Aki and Alex have been honored to speak and teach at professional conferences around the world: The World Pastry Forum, Star Chefs International Chefs Congress, International Association of Culinary Professionals, Women Chefs and Restaurateurs, the Experimental Cuisine Collective, The Flemish Primitives and the International Association of Culinary Professionals. The pair were invited to speak at Harvard in November 2010 and participated in a culinary round table at Cornell University in 2008. They have appeared as guest chefs for four Holland America cruises, leading demonstrations and teaching classes for groups from 12-150 people. Aki and Alex travel the United States and beyond cooking guest chef dinners and teaching culinary workshops. Aki and Alex appear in two episodes of Foodography on the Cooking Channel in 2010. Their consulting business was featured on an episode of Friday Night Arts on their local PBS station, WHYY, in June 2010. In 2008 they appeared in an episode of The Food Detectives on the Food Network demonstrating the uses of liquid nitrogen. In May 2009, Aki and Alex discussed food science with Michael Colameco for his radio program Food Talk on WOR in New York City. VIDEO: Ever Go To a Restaurant and Wonder What Was in a Dish? Flavor crystals: love salt but hate the sodium? Try seasoned salt.